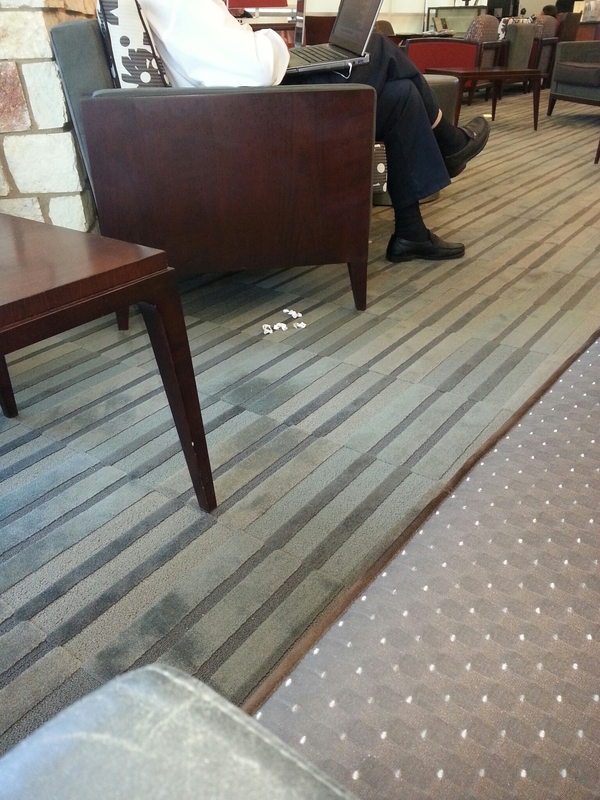 On a trip to my local library to meet up with a friend, I had a seat to wait out her delay and I noticed this gentleman sitting about 5 feet caddy cornered from me, nicely dressed in a white dress shirt and navy blue dress slacks and faded worn loafers, attractive, 60ish), well groomed, polite enough to be plugged into earplugs being contently amused by whatever was playing on his laptop, pulling single wrapped candies from his shirt pocket. He would then stick it in mouth and tuck it in his cheek, occasionally rolling the candy behind his front teeth with a slight pucker, twisting the wrappings up with his fingertips and ever so craftedly discarded each wrapping as he opened yet another and another candy over the period of time he sat gladdening himself with whatever it was that was holding his attention on the 14 inch screen. As I sat texting for the locale on a few people and yet intrigued in a growing annoyance sense, as the candy wrappings no longer pass for an oops. It is now an intentional pile to other library goers should they be paying any attention. Had he been a teenager I would have thought, Ah rebellion. Then I thought perhaps I was being too harsh and he will certainly pick them up before leaving. Here is the moment of truth, he is closing the computer, adjusting his position to stand and gathering his items. He stands up, turns towards my direction, takes notice of his little pile and walked behind me and was about to round the bookcase when I said, “Excuse me, but I believe the wrappers are yours, Sir”. He then told me with a thick accent,” SHUT UP, YOU SHUT UP I AM THE SUPERVISOR, YOU DONT TELL ME, YOU SHUT UP, and began to walk off between the isles I answered back, “Sir, I don’t care who you are, its not right to leave your trash on the floor for others”. As surprised & annoyed as I was I spoke lovingly. The others just shook their heads at his litter and shrugged their shoulders . It was a bit surprising to me that no one else said anything. Maybe it’s not that big a deal to others that a man would one nonchalantly leave his trash littered in the house of Education. Maybe he needed a book on Manners & Etiquette. You can dress someone up but good sense isn’t in the fabric they wear or seemingly in their heads either. Years back I dated a guy for a very short time. We differed so much in the area of common courtesy; I was embarrassed when we went to the movies and we got into a fight because he was going to leave his trash and I reached to pick it up. He said, “It’s the Ushers job to pick it up, not ours”. “No, your trash is always your responsibility”. He tried to argue that if people picked up their trash the movie staff wouldn’t have jobs”. “No, if they didn’t have to pick up your trash, they could use that time to vacuum, clean the carpets, wipe the stickies off of the armreasts, clean & stock the bathrooms. There are always things to do, they could do some of those other things more accurately if people didn’t leave their trash behind”. It’s simple, Pick up after yourself. It is not someone else’s job or place to do so. The other thing that surprised me was that no one had an issue with a man raising his voice at a woman. Hello, is there any civility left? When did it become acceptable to raise your voice or yell at a someone in response to a gentle reminder to do what is right? I don’t think he was the supervisor but let me tell you, if he is, He won’t be. Ut oh, do you happen to have any white out? Is it just me or does anyone else see something wrong with this picture?